The mod adds to the game 7 new types of armor, and each has a unique effect. Wooden armor - nothing special, it gives 5 points of protection. Stone Armor - gives 8 points of protection. Coal Armor - gives you the effect of resistance III, as well as 9 points of protection. Emerald Armor - gives the effect of increasing health III + 20 points of protection! Obsidian Armor - gives the effect of fire resistance III, 20 points of protection. 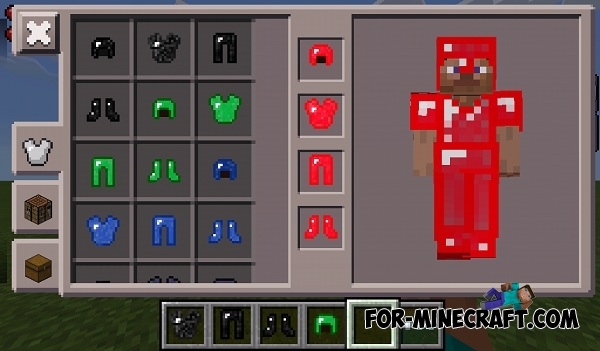 Redstone armor - increases your speed, but will also give 13 points of protection. Lapis lazuli armor - allows you to breathe underwater + 15 points of protection. For crafting armor you will need only 24 materials of each type - redstone, obsidian, coal, etc. 1.Extract The Two files , the "TerrainArmorMod.js" and The "TerrainArmor Texture Pack.zip"
2. Go to Blocklauncher and go to launcher options. 3. Click the Texture Pack and Select the "TerrainArmor Texture Pack.zip" from where you extracted it. 4. Enable The Texture Pack then, restart Blocklauncher. 5. Go to Manage ModPE Scripts and import the "TerrainArmorMod.js" from where you extracted it. 6. Enable ModPE Scripts then, restart Blocklauncher again. 7. Your all ready to go. 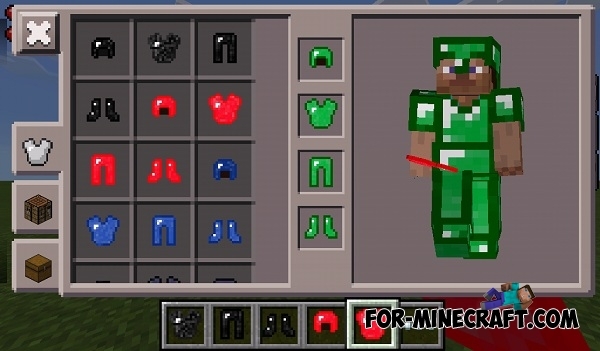 Armor Movement mod for Minecraft PE 0.10.5The mod adds various types of armor pieces that will make our lives better in Minecraft PE. GTA San Andreas v3.7 mod for Minecraft Pocket Edition 0.10.5The mod adds a bunch of new things, cars, body armor and new armor, weapons - knives etc, jetpack, a chainsaw and a bunch of other items and things!